'Tis the season... for all things red, pink, and sugar-y! 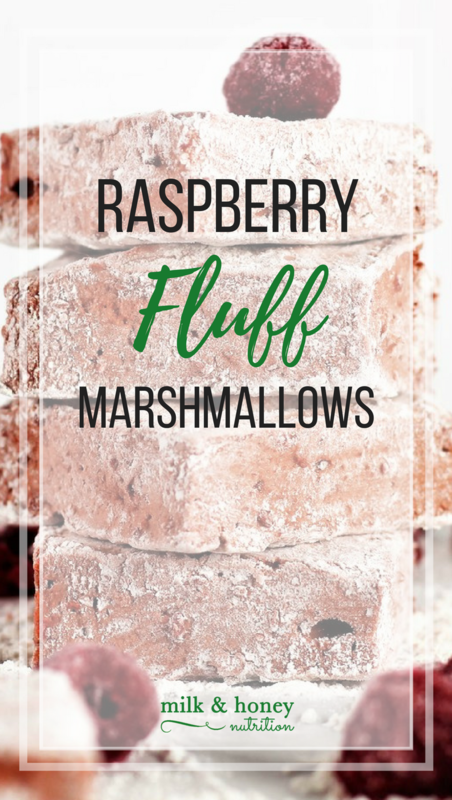 These Raspberry Fluff Marshmallows aren't anywhere close to my normal low-sugar type recipe, but they're a much better alternative to the store-bought kind. No red dye here... just the natural color of frozen raspberries... and they're just fun! Who doesn't love homemade marshmallows?! I'll admit, I've never been a big Valentine's Day fan. (I know, I'm a total Valentine's scrooge.) I was always in the camp of "let's boycot this sugar-laden man-made holiday, and all say we're not celebrating it". And my husband and I both tend to be super practical people, so the idea of going on a big elaborate date just never appealed to us, so we agreed early on in our relationship that we'd just do cards and call it a day. But... if you know me at all, you know I love any excuse to celebrate an occasion with food. So while we don't go all out, I've always tried to fix a special meal at home. And since our girls were born, I have loved doing fun desserts with them (like these Raspberry Fluff Marshmallows), and making some fun non-candy themed valentines for their friends. So, whether you have kids at home to entertain, or just want a low-key fun surprise for your significant other, these are perfect! The gorgeous pink color on these comes from frozen raspberries... both the raspberries themselves, and the "juice" after they're thawed. And their naturally delicious flavor really shines through in these... they're not overly sweet, so that signature tart-sweet raspberry punch is the first thing to hit your taste buds. Did you know raspberries are an excellent source of antioxidants (in the form of vitamin C)? And frozen raspberries, are processed and frozen right at the peak of their freshness, meaning the final product that ends up in your freezer is at its peak nutritional state. These Raspberry Fluff Marshmallows are a great way to use frozen raspberries, but the possibilities are really endless... like these Raspberry Yogurt Muffins and my Raspberry Chia Jam . This recipe was sponsored by the National Processed Raspberry Association. All thoughts and ideas are my own. Check out these other great dessert ideas!